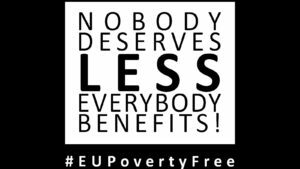 Brussels, 17 October 2018 – On 17 October 2018, the UN International Day for the Eradication of Poverty, the European Anti-Poverty Network (EAPN) calls on the EU to MAKE EUROPE POVERTY FREE! In Brussels as well as in several other cities in Europe, the message “Nobody deserves less, everybody benefits” #EUPovertyFree was projected on big public buildings, the hashtag was used on Twitter together with an invitation for people to sign our petition for Guaranteed Minimum Income Schemes. The fact that 118 million EU citizens (meaning 23.5 % of the EU population) are still living at risk of poverty or social exclusion, represents a failure of our political and economic systems, which need a radical reprogramming in order to make the EU Poverty Free. Part of this reprogramming must be ensuring the progressive realisation of well-designed Minimum Income Schemes. These schemes guarantee income support for everybody who needs it, for as long as they need it, enough to live a life in dignity and fully participate in society. In cash-based societies the absence of good quality Minimum Income Schemes exposes people to take intolerable risks. Cidalia Barriga, EAPN activist with direct experience of poverty: “The minimum income scheme was clearly not enough but it allowed me to feed my children and to ensure they could continue with their education”. Well-designed Minimum Income Schemes (MIS) do not only benefit the people who need them, but are better for everybody. They are indispensable for more equal societies; higher levels of equality tend to lead to happier and more cohesive societies. Minimum Income Schemes represent a small percentage of social spending and have a high return on investment, while the cost of non-investment has enormous negative impacts for the individuals concerned and high long-term costs for society. Carlos Susias, EAPN President: “We know that change is possible, at local, national and European levels. With this action, we want to invite people to express their support for a Europe Free of Poverty. We can all be part of the change that we need!